While the Porter airlines shortbread cookies and free coffee keep my company, I wanted to share this bright, fun mid-summer mani. So this time, I took a shortcut and used the What’s Up Nails palm tree vinyls. I wanted them to be black so I used the actual vinyl instead of the stencil. This was my first time using the physical sticker and I love how they look! 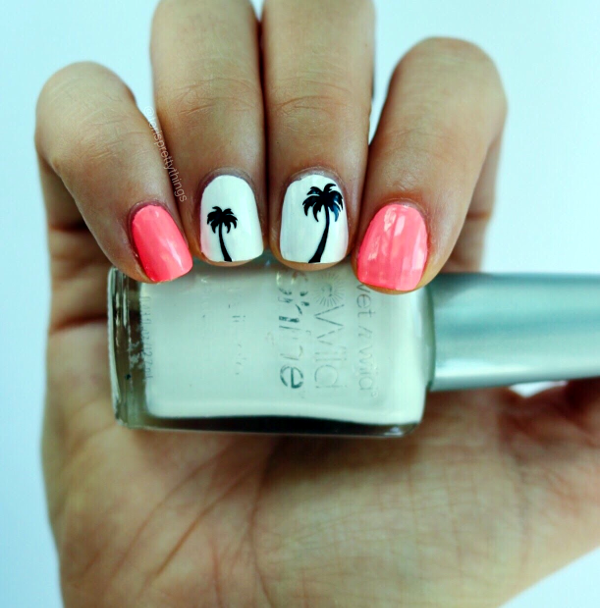 Inspired by this mani from Gabby’s Nail Art on Instagram, I love wearing a palm tree mani at least once each summer :). The best part? I used two drugstore colors to get this look! Carolina Beach is an older shade, from back when Julie G and Jesse’s Girl first started to collaborate together (This looks like the more recent version). The formula was a bit patchy but the beautiful shade makes up for it. It's hard to find a neon peachy pink like this in the drugstore! Then, you've seen it before and you'll see it again (and probably again after that!) French White Creme is just a go-to staple white shade that I can't be without.